Well, when I say extreme - I mean the most extreme the Lake District is likely to throw at you, we're not about to set off across the Sahara or the South Pole. It was only just over three months ago that we were subjected to a deluge of late snow and now here we are in the middle of a heatwave. For some inexplicable reason we appear to be drawn to the Langdale Pikes in extreme weather rather like a moth to a flame. No idea why, it just happens that way. We've climbed them in thick mist, pouring rain, ice, snow and now temperatures of over 25C and, as we battled our way through the heat last week, it got me to thinking about the similarities between hiking in freezing snow and ice compared to hiking in searing heat. Here's what I came up with. In both cases you'll need plenty of fluids; in winter we pack hot flasks of tea and in summer we take as much cold water as we can carry. The problem is that fluids are heavy so I tend to refill along the way but that presents a problem for me in either type of weather. In snowy conditions there are, sadly, no streams of steaming hot tea, and whilst some might romantically describe the "refreshing qualities of a clear mountain stream" I'd say it's more like "mind numbingly cold and likely to set your teeth off however much Sensodyne you've brushed with." 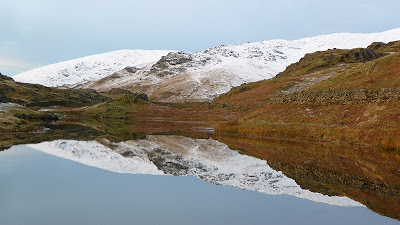 Top: Stickle Ghyll normally. 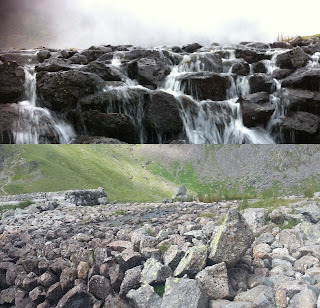 Bottom: Stickle Ghyll now. In a heatwave the problem can be finding water full stop. My rule has always been to fill my flask from fast moving water but last week we were hard pressed to find a stream with any water in it at all. Stickle Ghyll was more of a "trickle Ghyll" and I had to toddle round to Bright Beck to find anything moving. 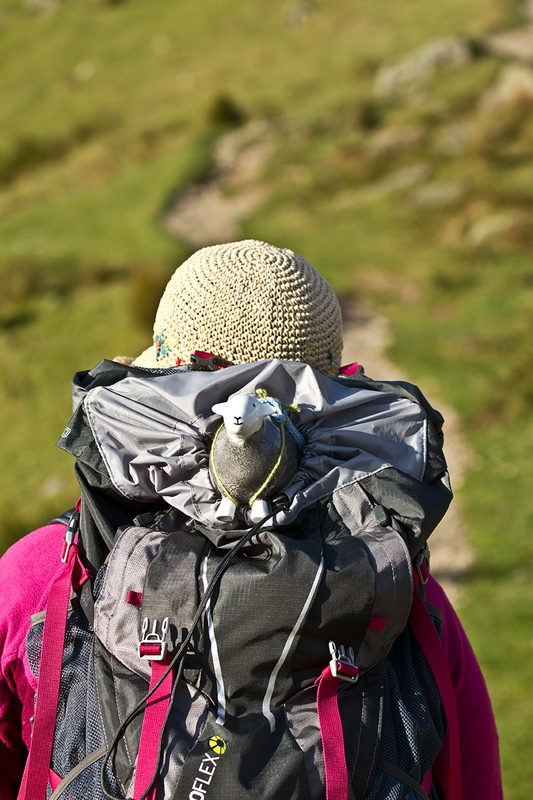 Don't underestimate how much fluid you will need on a hot hike. We got through several litres on the fell, then a couple of pints in the Sticklebarn before spending the rest of the evening re-hydrating with water at home. It's not until the weather kicks off that you realise how little shelter there is on the fells. In fact in the winter it's easier to find shelter than in the summer; ducking down behind a rock face, large boulder or summit shelter can usually get you out of the wind, but in summer you need trees and there aren't any. Well, there are a few lower down but as you get higher up they vanish completely so finding somewhere out of the searing sun to cool down and have a break is all but impossible. Many's the time I've cursed the strong winds on the summits but last week I would have given anything for a gust of something cool. 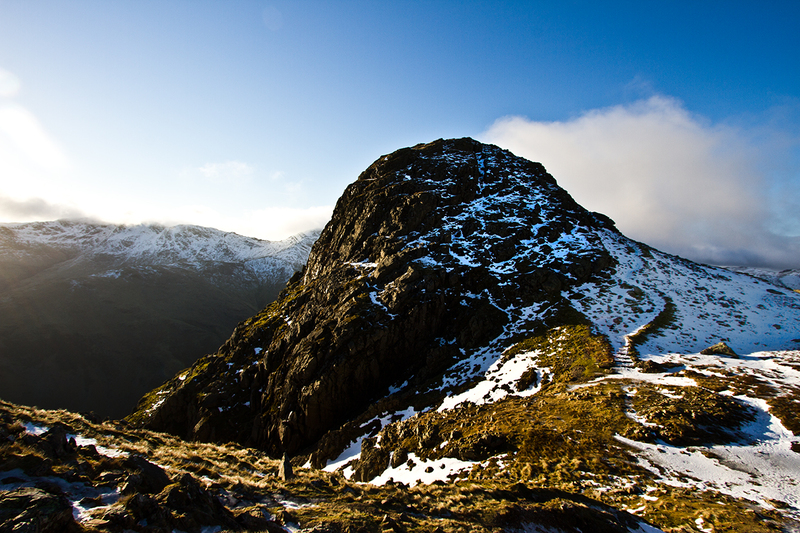 There wasn't a breath of breeze, even on the top of Pike of Stickle, and not a tree for miles around. 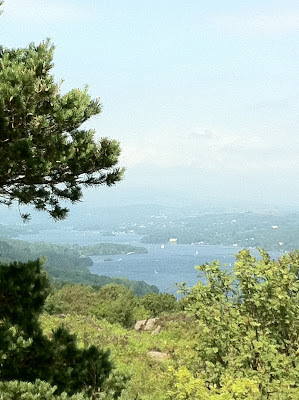 And don't think it's just the ascent that will give you problems, our descent was by far the most punishing part of the walk and we were very glad to be back in the shade of the car park. Now here's something that is, by and large, easier in summer than in winter, but don't get too cocky. In winter we're expecting frozen paths and therefore tend to tread carefully, in summer the over dry rocks and gravel tracks can really catch you out. Even Steve, who has the balance of a gazelle, was caught out several times on the track back down to the car. Dry, dusty soled boots will slip and slide over bare rock with incredibly ease. Snow and heatwaves also both make it easier to cross bogs, though there's always the hidden spot waiting to engulf the boot of the unwary hiker. At least when that happens in summer it can be a pleasant if rather stinky accident, in the winter frozen feet are no laughing matter. And just because it's hot that doesn't mean it's OK to hit the hills in sandals and flip flops. Proper footwear is still essential and a decent par of boots coupled with some proper woolen socks will still let your feet breathe. Top marks to the chap we saw descending in full length denim jeans and a long sleeved white shirt with buttons done right up to the collar; absolutely no idea how he didn't just keel over and melt. Pike of Stickle with ferocious guard sheep. In both sets of conditions you're going to need to allow yourself extra time to complete your route, and in neither case is it a great plan to tackle anything too ambitious. 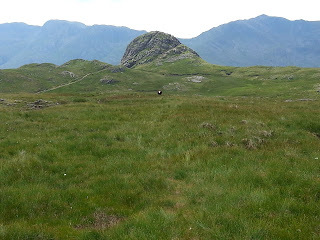 That's probably why we go back to the Langdales in extreme weather; we know the routes well and are likely to be able to keep ourselves out of trouble. In both conditions you'll need short, regular stops but at least in the summer there'll be somewhere to sit down that won't numb your bum. Whilst it's arguably harder to get lost in summer weather conditions be prepared for the conditions to change at a moments notice. Clear sunny days can quickly become hazy or turn into thunder storms later in the day so make sure you have your map & compass handy. Whilst the energy expended during a long hike means you can stuff yourself with calories, chocolate is a fickle companion. We've darn near cracked our teeth on a Snickers bar in winter and if you plan on eating one during a summer hike it's best to pack a spoon. Or a straw. Dried fruit and nuts work whatever the weather and our particular mountain snack of choice is malt loaf, especially since we discovered the banana variety. Be careful with meaty sarnies and egg based lunch products too in the heat. A six hour old egg butty that's rattled around in a hot rucksack all morning can knock an unsuspecting down wind hiker off their feet up to a mile away. Off course now I've gone to the trouble of writing all of this the weather will, undoubtedly, break and for that I can only apologise. What can I say? Micheal Fish taught me everything I know. Sorry. When is a secret place not a secret place? 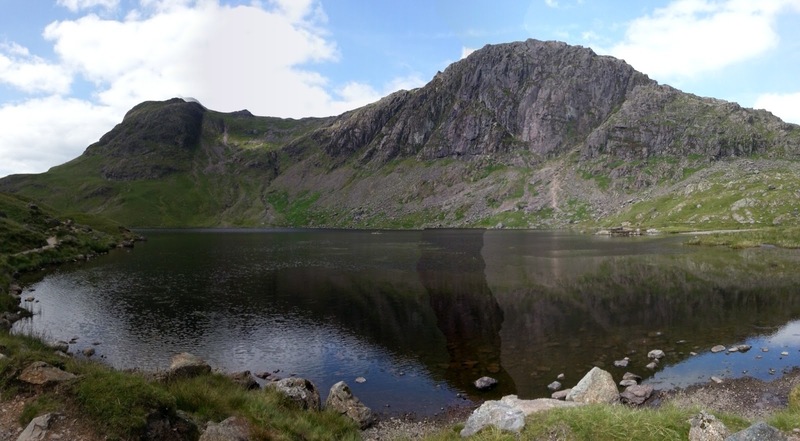 When it's on an OS Map so anyone can find it, which basically means there are no secret places in the Lake District, just places most people don't go to for one reason or another. I've made a point of trying to write about some of the more tucked away spots and that has sometimes landed me into trouble with folk who want to keep them secret, but in my book it's a crying shame when stunning views go unseen. I honestly don't think there's much that can beat that feeling of rounding a bend or popping out of some woods and being presented with glorious views and not another soul in sight. And then there's the crushing disappointment of planning a visit to a favourite hidden away spot only to find that someone else is already there. The cheek! So, how do I resolve this conundrum? Well, I've decided to set a challenge. 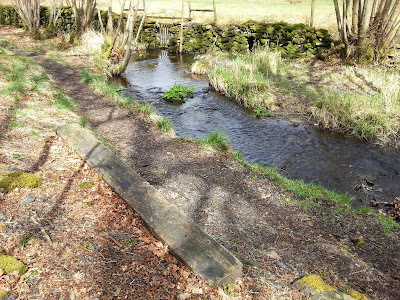 Below are five pictures of my five favourite hidden away spots and if you want to find them you're going to need to a) match the right picture to the right location and b) then find them on an OS Map. I think that's fair, don't you?